This FlexPod kit comes with everything you need to safely mount your TomTom GPS. 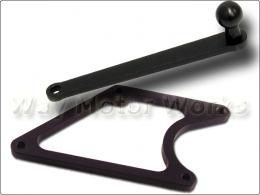 This unit will attach to the back of your tachometer, facing to the left or to the right. The arm extends outside the steering wheel and has a ball on the end. That ball easily snaps into the cradle that comes with your GPS device, which means it can also be removed in a snap. The height and angle of the screen are both adjustable. So you retain all of the functions you like about the suction cup mount; only with improved looks and reduced chance of theft.